Seafoam green is such a great shade. Green is my all-time favorite color EVAR, and I adore this incantation. 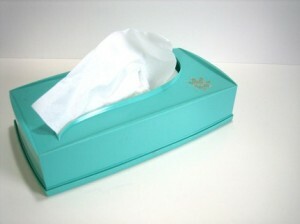 Blowing my nose might seem a little less dreary with this cute little box cover. This is SOOO 50s. I’m sure it would have sit quite prettily on a Mad Men-era desk back in the day. 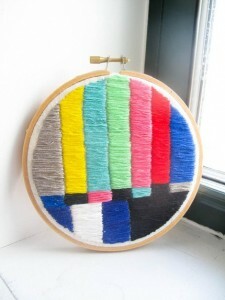 This embroidery piece is pricey enough that I will NEVER buy it, but is definitely cute enough to oogle! I love the bright splashy colors and the geometric sensibility… and it kinda takes me back to those old console wood paneled TVs of my childhood. I kinda love it. I’m sure it took countless hours of careful satin stitch to get this correct, so I don’t fault her for the price tag. But my measly pockets are no where near able to accommodate such frivolous design-nerd purchases. We loan books out pretty regularly. I’m an avid reader of fiction novels and when someone walks in and comments on a book we have that they’ve wanted to read… I can’t help but lend it to them! 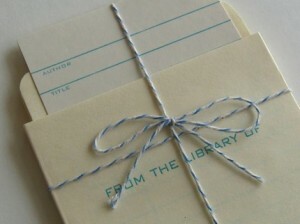 These letterpress library cards would be an amazing way to keep track of who’s got the goods. Nerdily delicious. 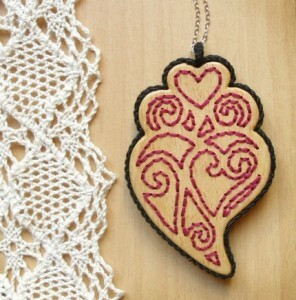 This embroidered wood pendant is pretty rad. I mean… how do they do that? Drill a bunch of tiny holes in a pattern and then embroider? It’s fab, and I think would make a pretty stellar crafty conversation piece. Now I’ve got the jewelry making bug. I still need a few tools and bit of hardware to really give the jewelry thing a try, but keep an eye on my shop for some jewelry additions in the near future!